“Six Feet Under” and “Arrested Development” fans may be surprised to know that well-known actor Ed Begley Jr. is also a staunch environmental campaigner. Together with his wife Rachelle Carson-Begley, he is building what will hopefully become a LEED Platinum-certified home in Los Angeles. In addition to a host of other great green features, the home will boast an incredible 10,000-gallon underwater rainwater catchment system. In light of the Federal Government’s latest National Climate Assessment, which stated this week that “Climate change, once considered an issue for a distant future, has moved firmly into the present,” actions we can implement immediately on a personal level have become a here-and-now issue for us all. 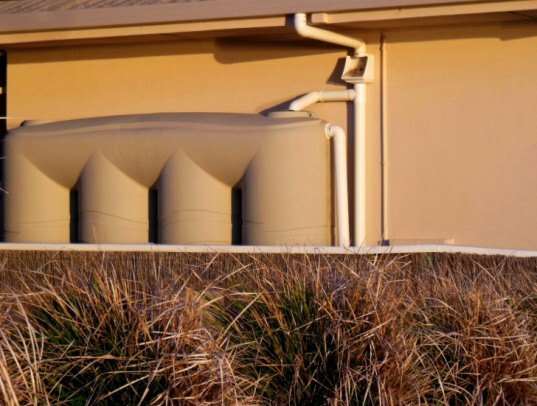 In an interview with Huffington Post reporter Jennifer Grayson, Begley outlined the extensive rainwater harvesting system he has built after years of DIYing with 50-gallon barrels stuffed under his house downspouts: a hack simple enough for anyone with a downspout to install. While his new system is slightly more sophisticated—and comes with a $65,000 price tag—he is quick to point out that a simple, fully installed, 500-gallon tank system will only set you back by around $5,000. Begley’s system uses an underground water bladder that captures runoff from the roof and hard-paved areas around the house. With heavy rain and his catchment area, it can easily be filled in two to three days. With California currently experiencing a vicious drought, however, it’s more imperative than ever to capture every precious drop when it falls. As he says, “There will be huge problems with water in the next five years, and by that I mean shortages and rationing. If you don’t believe me, drive to Lake Mead or do a Google search for ‘Colorado River delta’ and see: It’s dry!” Further problems exist for those living in areas where rainwater tanks are not permitted under state law; an issue worthy of further lobbying. 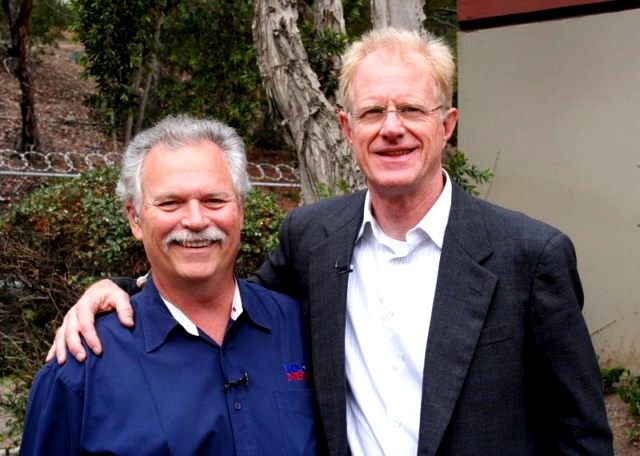 Actor and environmental campaigner Ed Begley Jr., here with Phil Konstantin, has installed a state of the art rainwater collection system in his new LEED-platinum-certified home. Rainwater tanks don't have to be eyesores, and can easily be camouflaged further with judicious planting.